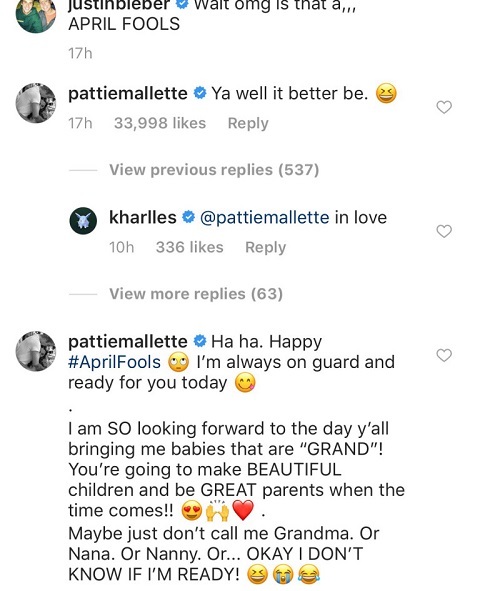 Following Justin Bieber's April Fools’ Day prank in which the singer jokingly announced that his wife, Hailey Baldwin, is pregnant, his mom, Pattie Mallette, said a lot about the joke. The Nowhere but Up author, 44, chose the comment section of the pregnancy prank post, which shows a puppy Photoshopped into a sonogram picture, to react on it. Featuring an eye-rolling emoji, the proud mom wrote, "Ya well it better be. Ha ha. Happy #AprilFools. I’m always on guard and ready for you today." I am SO looking forward to the day y’all bringing me babies that are ‘GRAND’! You’re going to make BEAUTIFUL children and be GREAT parents when the time comes!! Maybe just don’t call me Grandma. Or Nana. Or Nanny. Or… OKAY I DON’T KNOW IF I’M READY! His April Fools' day prank post also included staged photos of the model, 22, at a doctor’s office where she showed off her bare stomach. Many followers were upset with the singer for his controversial post, pointing out that there're millions of women who have been struggling with infertility. Last month, Justin and Hailey sparked speculations that they are expecting their first child when the Sorry crooner hinted at potential fatherhood while announcing he wouldn’t be going back on tour. The couple became married in a New York City courthouse in September 2018.